Laurel Louise (Erke) White, of Okemos, formerly of Bay City, beloved wife, mother, grandmother and sister, age 73, passed away February 25, 2018. Her faith was an important part of her life, and she especially loved Psalm 23 which gave her strength as she fought back from multiple strokes over 20 years. She was born May 23, 1944, in Rogers City, to the late John and Mabel (Lamb) Erke. 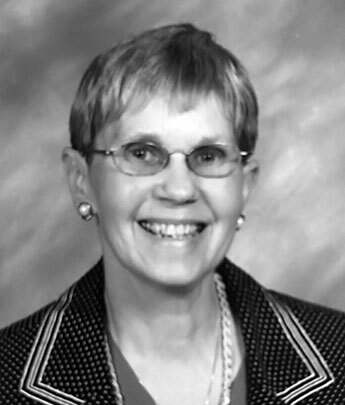 Laurel graduated from Rogers City High School, class of 1962, and went on to receive her Bachelor of Science in education from Michigan State University. Laurel taught for the Bay City Public Schools until her retirement in 1999. It was while teaching that she met the love of her life, Peter. They were married June 25, 1968. He preceded her in death August 16, 2003. Laurel is survived by her three daughters and their husbands, Laurel (Mark) Trombly, Katherine (John) Knoll and Sarah (Jeff) Powell; her grandchildren, Zachary and Tyler Anderson, John Arden and Ava Knoll, Melissa Powell, and Kirsten and John Trombly; her brothers, Keith Erke and Allan (Darla) Erke; sister-in-law, Carol White; brother-in-law, David (Beth) White; and many nieces and nephews. She was preceded in death by a brother-in-law, C. Roger White. Visitation was at the Penzien Steele Funeral Home in Bay City Wednesday, February 28, from 2 to 8 p.m.
A celebration of life will take place at St. Luke United Methodist Church in Essexville today (Thursday, March 1) at 11 a.m. with a luncheon to follow. In lieu of flowers, the family suggests memorials to the Peter A. and Laurel L. White Scholarship Fund at the Bay Area Community Foundation.